The Traditional Music Collection is a listing of audio recordings, music books, and videos with information on how to contact artists or their representatives. The Collection represents a wide variety of approaches to tradition. Some artists were born and raised within the culture or community that the tradition represents and some came to be involved with traditional music in other ways. Many traditional musicians in New Hampshire produce recordings of their music. Because these recordings are not always available in commercial music stores, we have put together a resource to help you find them. Search the Traditional Music Collection If you are looking for a particular type (genre) of traditional music, you can select one by clicking on the arrow to the right of the "Genre" box. To explore the entire collection, just click on the Search button without entering any information. The name of a musician – Please keep in mind that if you look for a person's name, all recordings in the Collection that he or she has played on will be displayed, even if the person was not the featured singer or musician. If you are a traditional musician, submit a recording to the Traditional Music Collection. 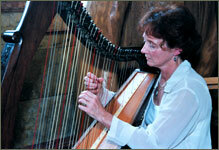 Would you like to learn more about traditional music in New Hampshire?